Over 450 Barbers will compete in a variety of categories ranging from Freestyle with Color, Freestyle Without Color, Speed Challenge, Theme Challenge and Self Haircutting Challenge. 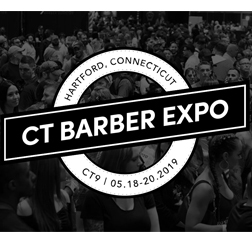 This years Barber Expo will feature an incredible Barber Battle with several categories, educational classes by the industry’s top barbers, vendor booths, product demonstrations, barbershop quartet, platform artists, and giveaways. On Saturday, May 18th, 2019, a pre-party will occur. Details are to be determined and will be announced. On Sunday, May 19, 2019, the Educational Seminars will take place from 8:30 AM to 2 PM. The Educational Seminars will be presented by some of the industry’s most respected educators. The Barber Battle and Expo will occur from 2 PM to 9:00 PM. On Monday, May 20, 2019, the Educational Seminars will take place from 8:30 AM to 2 PM. The Educational Seminars & Panel Speakers will take place from 8:30 AM to 2 PM. The Barber Battle and Expo will occur from 2 PM to 7:30 PM.